Although this month is one of the really great ones for Airstreaming in the southwest, we’re mostly staying at home. Since the Airstream is usually out from May through September, the mild weather of a southwest Fall season is the ideal opportunity to catch up on the rest of life. Maintenance on both of the Airstreams is part of it, thanks to cooling temperatures and a near-total lack of rain, but far more interesting is the process of planning for the next round of events. I have spent much of the past week trying to wrap up the event schedule for Alumafiesta. After many hours of research and coordination, I am extremely glad to say that a Preliminary Event Program is ready for public release! We posted it on the Alumafiesta website today. The program is looking very ambitious and I think it’s going to be another hit. We’ve got seven seminars, four evening presentations, musical entertainment, sword swallowing, five Happy Hours, four yoga sessions, a bike ride, a big hike and two walks, glass-making, six meals, five off-site tours, a cooking demo, cooking contest, three Open Grills … AND we’re working on a few surprises that aren’t on the Preliminary program yet. One of the requests we got last year after Alumafiesta was to make sure it didn’t repeat exactly in 2014. I get that. If I were attending from another state, I’d be disinclined to drive back to Tucson and do the exact same things all over again. So we tossed out most of the excursions we did last year and substituted five new ones, plus we brought in two new entertainers, and added more seminars. We will do the same again in 2015, because there’s a lot of stuff to do in this area! There are still a dozen details to nail down, but we are close enough to done that I can relax a bit and do the fun research. You see, somebody has to actually go to all of the places that we will visit during Alumafiesta and check out the details. This includes the tedious details like verifying that the driving maps are good, and that each parking lot has enough space, as well as the fun stuff like testing the menu at the various restaurants. I always leave this part for last because I regard it as my reward for weeks of desk work. I get to abandon my desk, get out for a few hours, and make sure that everything we’ve planned for the event meets a high standard. Restaurant testing will be next. I suspect I will have volunteers to help with that task, too. I hope to see you in Tucson next February! Campers tend to go shorter distances, focus on the weekend or vacation getaway, have campfires, hold social events at their Airstream, and decorate their site. They load up with the awning lights, elaborate ingredients for cookouts, lots of chairs for friends to use, musical instruments, fire wood, etc. and mostly just plan for a few days out. That is always fun, but it has rarely fit our lifestyle, so we tend to the traveling mode. That means we use the Airstream as a rolling hotel, and we’re out for long periods of time. We carry tools for on the road repairs, rather than pink flamingos. We pack for weeks or months. When we arrive, we’re not likely to break out the s’mores and lawn chairs, because we’ve got things we need to do at our destination. It’s still fun to go to a great place and explore, so our basic enjoyment of the freedom afforded by the Airstream is the same, it’s just some of the practicalities are different. So it’s a big deal when we do finally switch gears and use the Airstream as a weekend getaway. I think it happens about twice a year on average. This weekend was one of those times. On the last few days of our trip back west this September, we thought about the prospect of being in the house all winter and (as always) started talking about places we could go instead of staying home. Before we even pulled in to our driveway we had a weekend trip sketched out, and then Eleanor discovered that Alton Brown’s show was coming to Mesa AZ and so we planned a second weekend trip around that, too. I would like to say we went all the way and had a campfire and sat out under the stars here at Lost Dutchman State Park (Apache Jct, AZ), cooked on the outdoor grill and made s’mores, but the plan was to take advantage of the urban distractions of the Phoenix metroplex. So instead we spent our evenings at the Japanese Friendship Garden taking in the fabulous Otsukimi Moonviewing Festival, and in the Mesa Arts Center watching Alton Brown’s hilarious food show. While it’s boring to have a weekend with nothing to do at home, it’s very nice to have the same in the Airstream in a beautiful scenic desert park. 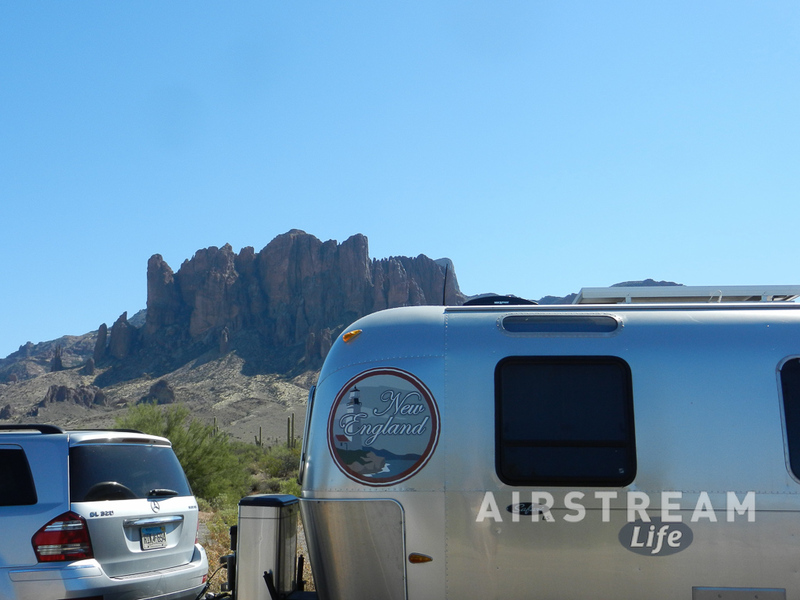 In the mornings around 8 a.m. the sun crests the Superstition Mountains to our east and illuminates the Airstream, reminding anyone who is still in bed that another beautiful day awaits. In the afternoons it’s a little warm and the drone of the fans inspires napping, so I’ve taken full advantage. I brought a couple of 1960s era paperback science fiction novels and picked up a copy of Tom Brokaw’s “The Greatest Generation” at the Mesa Swap Meet, so I’ve got plenty to read whether I want escapism or reality. Nice hiking trails surround us, and on other trips we might feel obliged to go hike them all, but on this trip we are content to look around and make notes for some future visit. There should be no obligations when you are weekending. I’m glad we took this weekend to explore the “other mode” of Airstreaming. We’ll do it again this winter, on our annual visit to Anza-Borrego. On that one I plan to bring the Weber grill and the Dutch Oven, and a chair or two so we can really get into the camping mode. It gets cold at night in the desert in January, but having to don a warm hat and cook in the darkness at 5 p.m. by headlamp enhances the camping sensation. Going to camping mode reminds us of why we got into this lifestyle in the first place, and it keeps us balanced, so that the Airstream is not just an expedient for travel but a way to reconnect with the outdoors, our family, and ourselves. A friend called the other day and lamented the age of his Airstream, just ten years old. At that point you’re well out of the honeymoon phase, and maintenance becomes essential. It can seem like you’re constantly fixing up things, in between trips. That’s happening to us as well. It’s unavoidable, whether you’ve got a house, boat, car, RV, or marriage. Maintenance is part of the deal. My daughter is just 13 years old and she’s already had braces, eyeglasses, and a broken foot. So I guess I shouldn’t be surprised that my Airstream needs a little TLC after eight years (Oct 2005-Oct 2013). I think this is a good problem to have. You don’t hear a lot about owners of other RV brands fixing up their ten, twenty, thirty, forty, or even fifty year old trailers because they are usually long gone by then. I like the fact that at eight years, our Airstream is still just a teenager. That’s in “Airstream years”, which are like dog years. I figure every year of an Airstream’s life is like two years of human life, making our Airstream the equivalent of 16 human years old. Most of the elderly Airstreams date from the 1950s, making them 53-63 years old, or 106-126 in “Airstream years,” but almost all of them have been refurbished back to new status by now, which kind of resets the clock. The oldest un-refurbished Airstream I know is Fred Coldwell’s “Ruby,” a 1948 Wee Wind, and she’s a grand old lady at 65 (or 130 in Airstream years). You don’t find them like that very often. Ruby lives in covered storage and only comes out on special occasions. This week I towed the Safari over to my friend Rob’s house to do some work on it. My carport is great but I can only access three sides of the Airstream when it is parked, whereas Rob’s driveway has tons of space. I recruited Mike (who previously helped on the flooring replacement and A-frame re-paint last spring) to help with this morning’s two projects. The first job was the silver rub rail that goes around the lower edge of the exterior. This is a flexible stick-on trim that fits into an aluminum channel. After a while the silver goes chalky and then the adhesive lets go. A piece on the front right stoneguard came loose in Tucson before we launched this spring, and the same piece on the opposite side peeled off on the highway in Ohio last June. So when we stopped at Airstream in September I bought enough replacement silver trim to do the entire trailer. While I was there, I had a chat with Kevin, one of the techs in the Airstream Service Center, and he tipped me off on the correct procedure to replace this trim. 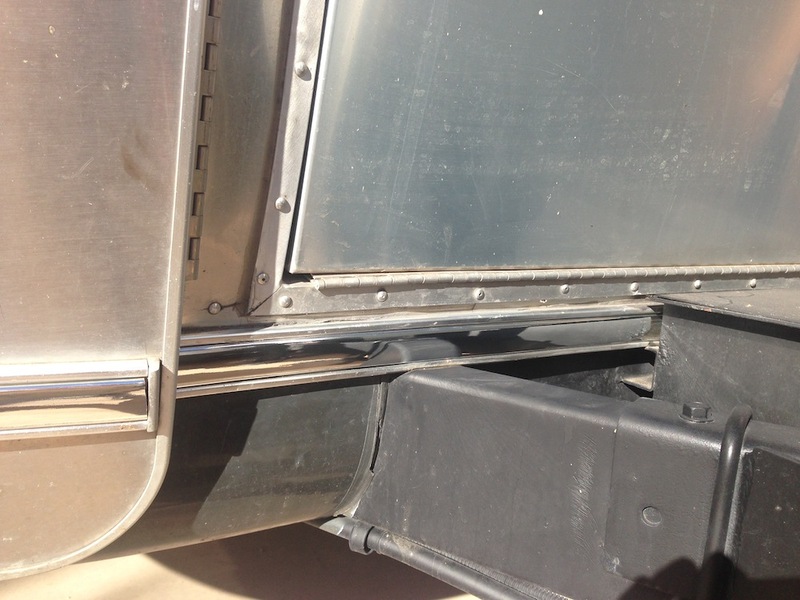 First, we swung out the stainless stoneguards at the front of the trailer. There are three 7/16″ nuts to remove on each stoneguard, and then they swing out on hinges. (Video of how this works.) This gives you access to the rub rail that goes behind the stoneguards. Next we peeled off the old trim. It was old enough that it peeled off easily, and didn’t leave much residue. Then we cleaned up all the dirt in the aluminum channel with soap and water and a sponge, followed by a little scraping of leftover adhesive. The final cleaning is done with rubbing alcohol on a rag. Airstream sells a little bottle of special adhesive primer for about $14 (JPC Primer 94 in a “dauber applicator.”) This stuff preps the aluminum surface for the 3M VHB adhesive that’s on the back of the new trim. We applied the primer to the cleaned channel, let it dry for five minutes, and then stuck in the shiny new silver trim. The ends were cut with kitchen scissors. Overall: pretty easy job, and the results are great. The new silver trim really reveals how badly the rest of the trailer needs a wash! The other job of the day was a bit nastier, replacing yet another Hehr window operator. I’ve written about this job before, so I won’t detail it, except to say that the emergency escape window is even more annoying than the others. It takes a different gearbox (a “center” operator, part #119-331) and replacing it is just a giant pain. I needed a special horizontal bit driver and an extra long Phillips bit to get several of the screws out. You might be able to do it with a regular Phillips screwdriver but I wouldn’t want to try. Finally, I fixed the MaxxFan that spontaneously de-constructed itself a few weeks ago. The fix was much easier than I expected, and it could all be done from the inside (avoiding a trip to the roof). Two nuts hold down the motor and fan assembly. I just removed the screen, unbolted the fan blade, and re-attached the motor. The fan is fine now but it has always wobbled a bit (the blade is somewhat out of balance) and after inspecting it I decided to order a new one. So that should be coming in the mail next week and will take only five minutes and a 1/2″ socket to replace. All of this consumed about four hours of the day. I figure a good Airstream tech would have taken about two hours to do this work, at a cost of about $200. Doing it myself added to my store of confidence and taught me a few things, and gave me a chance to hang with Mike and Rob, so I figure the $200 savings was just a bonus. And that’s what I told my friend who called earlier this week about his Airstream maintenance woes. “Find some people who can guide you, and learn to do it yourself,” I told him. You’ll be surprised what you can accomplish with just a little motivation and a few tools. I don’t like having to go fix things, and I still grumble about it, but once I’ve done it I’m usually glad to have made the effort. So I don’t fret about the higher maintenance needs of my teenage Airstream. I hope I’ll still be fixing things myself on Airstreams for many years to come. OK, we’ve been off the road for a few weeks. But is that any reason to be going to the cats? I would say “going to the dogs” but we are admittedly cat people, and you know that Eleanor and Emma foster kittens from the local Humane Society in between trips. It was not long after we landed in Tucson that the first batch arrived: six cute kittens needing two medications each in the morning, and three medications in the evening, plus a little of our patented kitty socialization school. Having a batch of kittens will turn anyone’s life upside down. Kittens want to jump, claw, fight, eat, and sleep—all the time, and if they can figure it out, all at the same time. 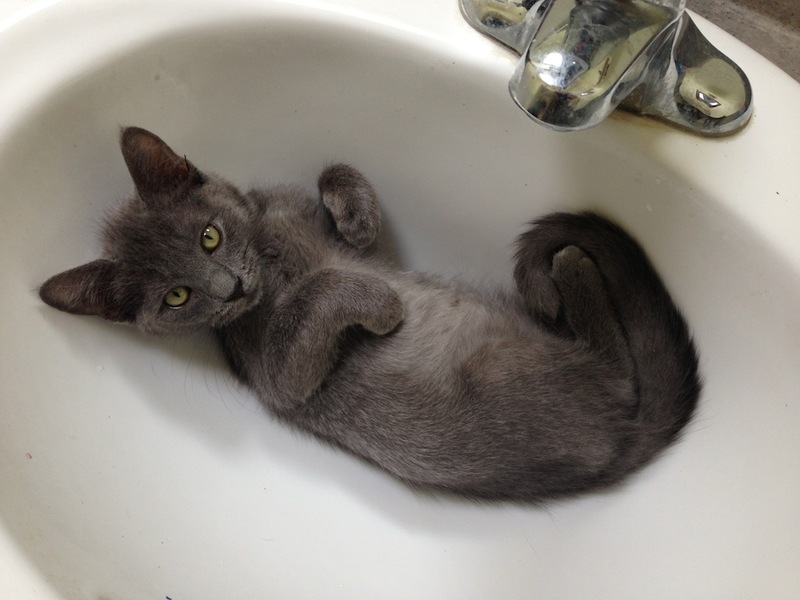 Kittens have no respect for litter boxes, so twice-daily cleanups are just part of the routine. They don’t know how to share, and if it suits them to tip over a bowl full of water in the middle of the night, well, you just have to get up and deal with it. In short, kittens are born with the knowledge that humans exist to serve them. But in this house they are also patients, so we don’t take much flack when it comes to medicine time. Their claws get trimmed (by me usually), and then with their defenses lowered we deal with them assembly-line fashion: first a squirt of medicine in the mouth, then a dab of ointment in each eye, and finally the despised nose drops. After a few minutes of exploration, Chester decided to depart the roof. 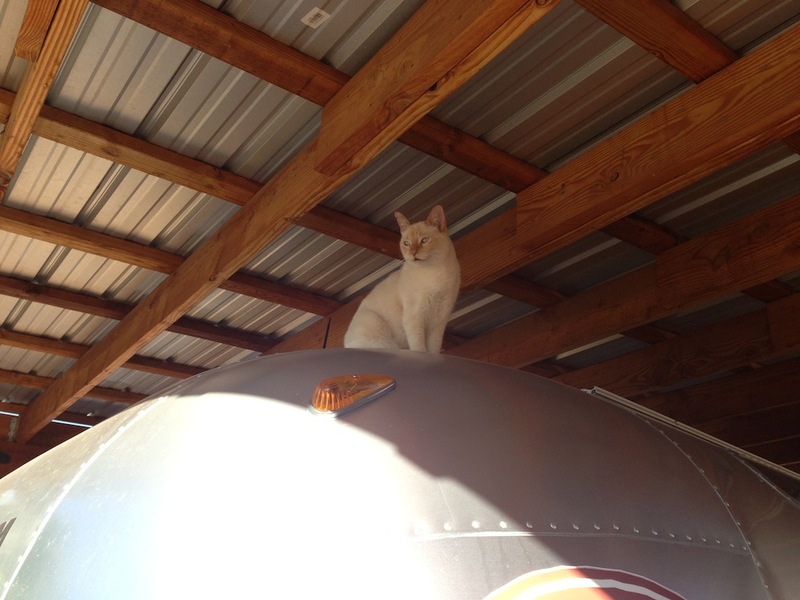 But jumping back to the house wasn’t appealing to him, so he decided to see if sliding down the front dome of the Airstream would be appropriate. During the testing phase he stepped just a bit too far out, and began to slide down the dome. I watched, completely helpless to do anything, as Chester put out his claws and ever-so-slowly, excruciatingly, slid down the aluminum dome leaving a foot-long claw scratch in the clearcoat. Anyone who owns an Airstream can feel my pain. Fortunately for Chester, he’s a very friendly and fluffy cat. I couldn’t bear to gut him on the spot, as was my initial instinct. Also, Rob was there watching. So I picked Chester up, rubbed his tummy, and told him if he ever did that again he’d become a small yellow bath mat. Chester later redeemed himself by catching a pack rat beneath the trailer, and the scratch in the clearcoat was shallow enough to buff out. So Chester and I are friends again.